Under a new ruling by the California Public Utilities Commission, small utilities can now allow customers to unify multiple meters under one bill for net-metering purposes because it will have no effect on non-solar customers. The California Public Utilities Commission (CPUC) reached an aggregate net metering decision last week that could have long-lasting effects that ripple far beyond the Golden State’s borders. In the immediate term, CPUC Resolution E-4854 allows small investor-owned utilities (IOUs) the same rights it granted the Big 3 (Pacific Gas and Electric (PG&E), Southern California Edison (SCE) and San Diego Gas & Electric (SDG&E)) to allow customers with multiple meters to unify their readings for purposes of net metering payments. As other states parse the decision, they will also discover another CPUC finding with broader implications: The CPUC found for the second time in five years that aggregate net metering arrangements do not increase costs for non-solar-using ratepayers. This finding undercuts a popular (but false) myth perpetuated by utilities across the country that solar users are selfishly using the grid as a storage facility without paying for its upkeep, thereby increasing other ratepayer bills. While more than 16 studies across the country have shown otherwise, the zombie lie continues to stalk solar development. The CPUC resolution, however, not only debunks the broader net metering falsehood, but bolsters the defense by saying definitively that even aggregate net metering, used by larger, multiple-meter installations, doesn’t increase those costs. Designed to implement further 2012 Senate Bill (SB) 594 that allowed for aggregate net metering in the first place, the ruling expands the rights the larger IOUs have had for four years to smaller IOUs like Liberty Utilities and PacifiCorp and Golden State Water Co. (dba Bear Valley Electric Service). It should be noted that neither the ruling nor SB 594 raised the net-metering cap, currently set at 5% of peak demand. The result, the CPUC found, was that the same amount of solar will be installed regardless of the most recent net metering decision. According to the CPUC decision, 59% of the state’s net-metered capacity was non-residential generators, but the same generators only accounted for 9% of the cost. In part, that’s because larger DG systems generally have a lower cost per kWh exported, which results in lower costs for non-participating customers. 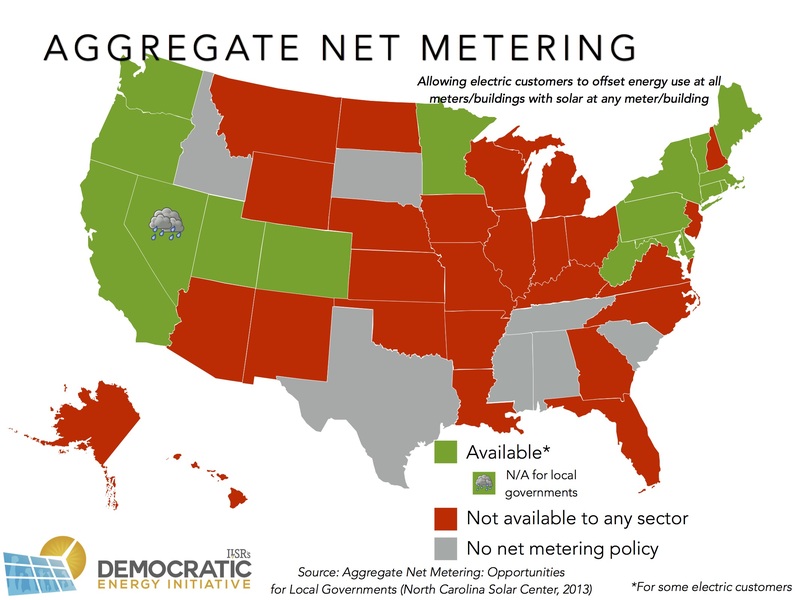 IndianaDG recommends humming the 1966 Beach Boys song "Wouldn't it Be Nice"--if you are old enough to remember that--while reading the above article about aggregate net metering in California. Yes, these types of energy policies are possible and do exist in other places. Aggregate net metering is the practice of allowing one or more customers to combine their electrical meters for the purpose of net metering.